Ingenious Corrugated Picnic basket « Corrugated Of Course! 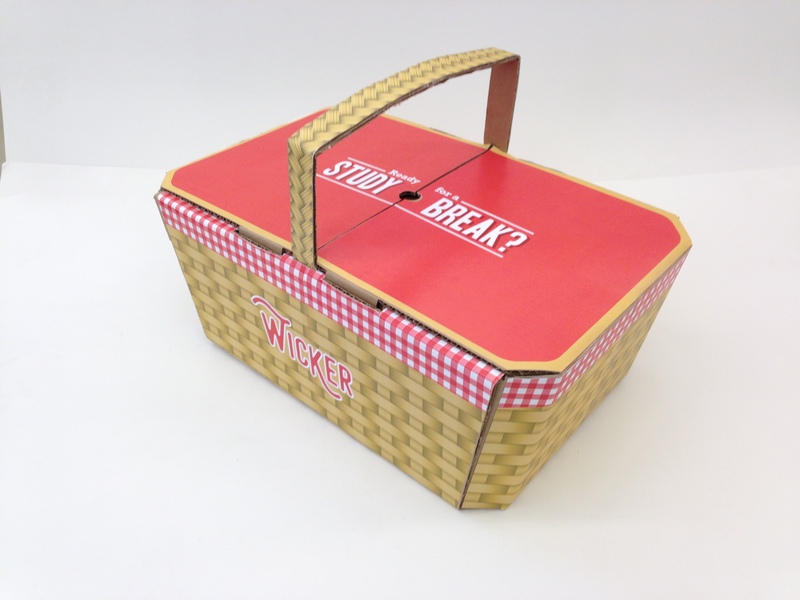 This picnic basket package is a prototype designed by students at the California Polytechnic State University. The design is intented to mimic a picnic basket both in design and function. The basket body is made of a single piece of corrugated that is assembled with fold-over tabs to reduce the amount of adhesives required. The handle is hidden away inside the basket to protect it in shipping and then lifted into position upon opening the package’s outer flaps. Inserts and inner flaps provide a series of compartments for each food item and extra protection to glass items. The inserts not only keep food organised but also provide structural rigidity and a flat firm surface for the top flaps to rest upon. Not surprisingly, the visually appealing picnic basket won first prize in a corrugated packaging competition in the US.